It gives a variety of data by country. 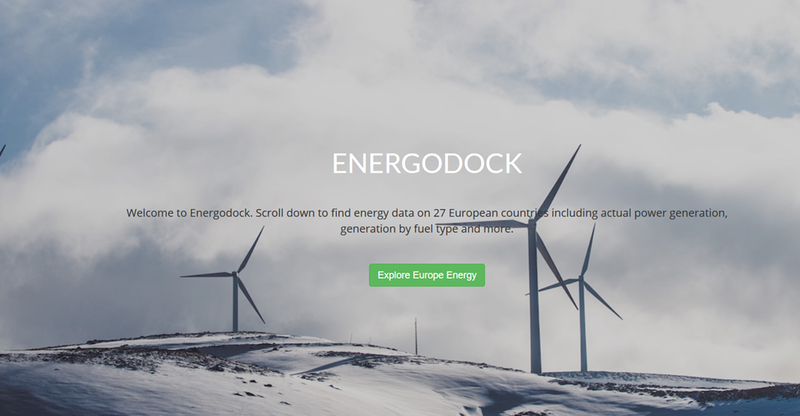 I have used it to analyse generation data across Western Europe for last month. (I have ignored Eastern Europe at this stage). 1) Fossil fuels still account for 33%, despite the dominance of nuclear in France (73%), and high renewables share in Germany. 2) Solar is to all intents and purposes irrelevant in winter months, even with some output from Spain. Total solar capacity for Western Europe is 98GW. Output of 3049 GWh in January equates to just 4% of total capacity. 3) Wind at 16% is very similar to the UK level. About half of the total comes from Germany and the UK. 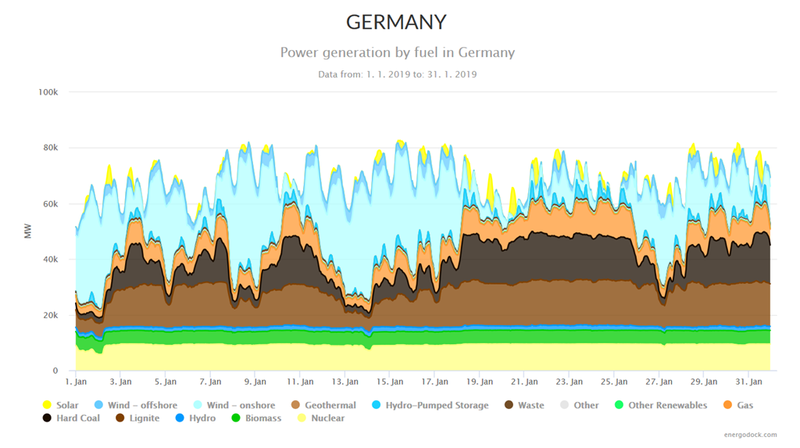 As in the UK, wind output is extremely intermittent in Germany. Notably, output was very low in both countries for several days around 20th January, running at 38% of the average for the month as a whole. According to BP, wind power capacity in the UK and Germany amounts to 75.7GW. With output down to 1575 GWh between 19th and 25th Jan, utilisation would have been down to 12%. 5) Nuclear generated 65 TWh during the month. France accounts for 40 TWh of this, and Germany a further 7 TWh. 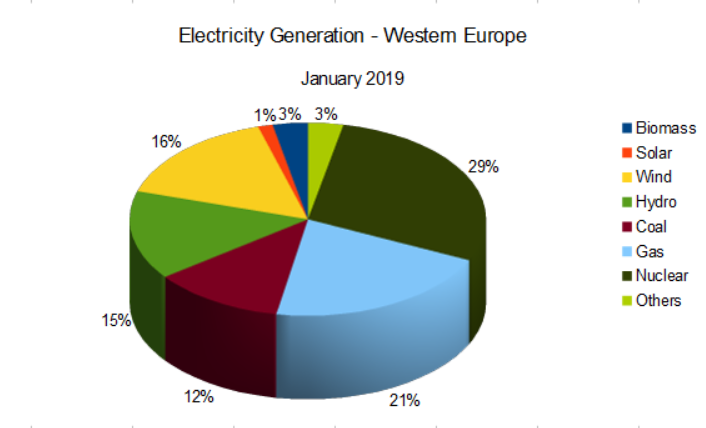 With Germany already committed to close their nuclear capacity in the next few years, and uncertainty around French policy, it is evident that Western Europe as a whole will remain heavily dependent on fossil fuels for the foreseeable future.. When will our, and their, politicos understand the problem? What problem…. they’re saving the planet!! For GB, Gas generated 52.5% of our needs and Coal 7.1%. Likewise, 13.03GW of solar worked at 2.97% CF for the month, generating just 1.1% of our needs. Is there a similar site for all gas usage, including industrial heating/processing? This would give the total picture for the (impossible) challenge of transfer to renewables. Not as far as I’m aware, Ian. But then gas’s main benefit is that it is relatively unaffected by the deep fluctuations such as caused by highly intermittents; and, can cheaply be stored in quantity. The gas grid holds approx 1-day’s worth of supplies (linepack); the electricity grid holds not a seconds’ worth. Top right corner is Actual Demand info. Click button to go to Actual Demand Graphs page. Think I have said this on here before, but it bears repeating. When Thatcher died, her biographer was asked what her greatest quality was. I was really surprised when he said that she would not stand for wishful thinking in any debate. Since those days, we have allowed wishful thinking to become not just common, but to predominate, nowhere more so than in the whole Green/Climate Change lunacy that has taken over so many countries. Just wishing something were true, will not make it so. Well my slight disappointment is that I am getting to the age where I am unlikely to see how all this stupidity in science and energy pans out. There are signs that more “science” is creeping in to the debate – but the MSM will take some shifting. Climate science is enabling the worst decisions to be made. History will judge them harshly. Every week I come across folks who still think the Earth’s average temp (if such a thing exists) is still rising steadily, that Arctic sea ice is melting rapidly, and that polar bears are facing extinction – but why would they know any different???!!! Many boys have been shouting that the Potentate has no garments on for a decade or more, but what will it take for the pack of cards to fall? Too many people have skin in the game now, far too many sinecures in academia and easy subsidy harvesting depend on it, too many reputations (political and scientific) are at risk, too many have been brainwashed to believe in the scam. A couple of years back a retiring Scandinavian climate scientist (link lost now) admitted that Sweden had seen no warming really in a century and he worried that we were driving the cost of keeping warm in totally the wrong direction. 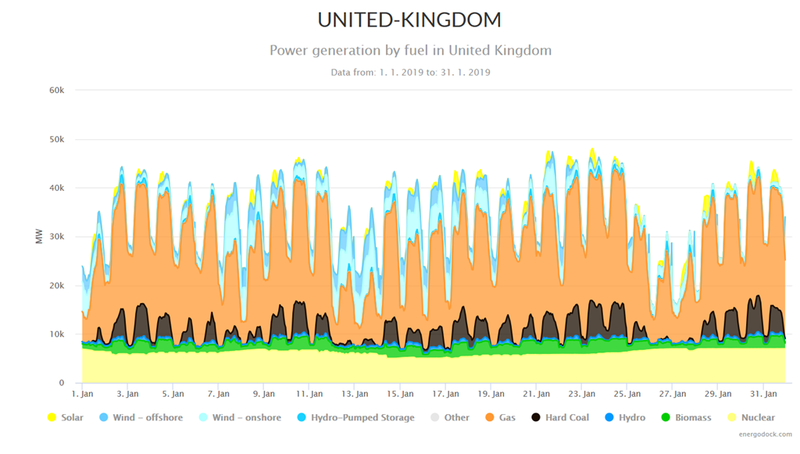 The chart for GB doesn’t seem to show the amount of electricity imported through the interconnecters. Been running mainly at maximum capacity for a few years, no doubt with great benefit to the balance of payments. Because that’s ‘generation by fuel’.